Among many reasons I love to knit and crochet, is to make gifts for others. Painting and drawing does not lend itself to this quite so well…yes, I can and have given artwork to friends and family, but that’s a bit tricky: will they like the subject matter? does the style and palette fit with their decor? Do they have wall space for this? But who doesn’t love a usable gift like a washcloth, slippers, ski cap, or baby booties for their newborn? 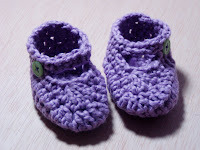 I love to knit or crochet booties for the gals in our church who have had a baby and I found this adorable free pattern online for mock mary janes. They are perfect for a summer baby! And I had this yummy lilac (they look blue here??) cotton leftover from making the cupcake sweater (which I should show you sometime). The booties only required a smidge of the yarn and I added two buttons to make it look like they are buttoned up. Now my head is swirling with thoughts of a little cardi to match…I’ve gone through all my books and patterns, next I’ll try the wonderful world of free patterns on the net, and if I don’t find what i want, then I’ll create something simple to accompany these little cuties.